While most international attention has focused on recent developments in Japanese monetary policy, there are interesting developments on the fiscal side too. A key issue is the proposal to raise the national consumption/sales tax from 5% to 10% in two stages beginning in April next year. Japanese Prime Minister Shinzo Abe says he will wait until probably the autumn to make a final decision, and the macroeconomic outlook will be a key factor. The proposal has the support of Bank of Japan governor Haruhiko Kuroda. However the more interesting question for Kuroda is how the Bank will react to the sales tax increase. Much of the reporting on this issue is along the familiar lines of whether it is better to focus on reducing the government’s very high level of debt (raise sales taxes) or ending deflation in Japan (don’t raise sales taxes). While this debate is a familiar one, there is an additional twist with a sales tax. An anticipated increase in sales taxes, by raising expected inflation, will - other things being equal - provide an incentive for consumers to bring forward their spending. Macroeconomists would describe this as a real interest rate effect, but in simpler terms it makes sense to buy before prices go up. However, this effect only occurs if monetary policy does not react to the sales tax rise, and the increase in headline inflation that this will bring. If every percentage point increase in inflation is matched by the same increase in the nominal interest rate (and we ignore taxes), the effect will disappear. (Prices will rise, but so will the value of my savings so I can afford to wait.) If the Bank of Japan attempts to reverse the increase in inflation by tightening policy still further, then we get a very undesirable outcome. These considerations suggest two things. First, if they take place, increases in sales taxes should be deferred by long enough to allow any bringing forward of spending to happen. The worst thing you can do in current circumstances is implement an unexpected sales tax hike. Why not raise sales taxes by 1% each year for the next five years? Those who suggest that acting gradually ‘risks losing the credibility of financial markets’ should be ignored. Second, the Bank of Japan should commit to ‘see through’ the impact of sales taxes on inflation, and not tighten monetary policy in any respect (conventional or unconventional) following the increase in inflation that higher sales taxes will bring. It would be good if that commitment can be made publicly before the increase in sales taxes is confirmed. This is off the usual macro beat, so probably this point has been made in a much clearer way by others, but it is hardly ever made in the public debate, and I have read economists who argue the opposite. It was prompted by the UK government’s predictable decision to kick ‘plain packaging’ of cigarettes (example below) into the long grass. One of the arguments used against plain packaging is that it represents yet more paternalism by the government. My general thought is this: is banning advertising paternalistic, or is it enhancing our freedom? A simple definition of paternalism is an action, by a person, organisation or the state, which limits the liberty or autonomy of other people for their own good. So we have individual freedom, interference, and crucially motivation. Advertising is usually portrayed as just providing information so that consumers can make informed choices. Sometimes it may do that. But advertising is often about suggesting associations, which provide no information at all. It is a mild form of brainwashing. Most of the time it is simply annoying. So a government that prevents advertising can be seen as allowing individuals to make their own unencumbered choices. It is giving us a little more freedom and autonomy, rather than limiting it. The argument for advertising has to be that the benefits to the few in getting useful information outweighs the costs to the many in either avoiding it, or getting information they do not want. It is not paternalistic to ban advertising, just as it is not paternalistic to stop people being stalked. That is the general point which hardly ever seems to be made. It applies, for example, to banning food advertising aimed at children, where the nuisance element of the advertising has to outweigh its information provision. However the debate about ‘plain packaging’ is not about either packaging that is plain, or the pros and cons of advertising. 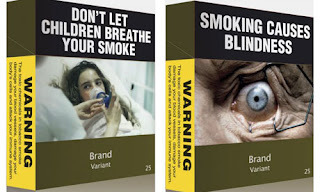 The Australian version of plain packaging replaces the logo of the cigarette with a picture of one of the health risks if you smoke these cigarettes (see below). So it is not about banning advertising, but replacing one type of advertising with another. Those who do not smoke and have no intention of smoking are not forced to look at these adverts, so banning this kind of advertising would not increase their freedom. For those who do not smoke but might smoke, and probably for those who do smoke, the information content of the ‘plain packages’ is clearly much greater than packages that were dominated by a logo. So this is one example where the information content of advertising does dominate any reduction in freedom that the advertising entails. One final point about information. Mark Littlewood, Director General at the Institute of Economic Affairs, says on their website that following the government’s decision: “Hopefully this will mark a turning point against the excessive elements of the health lobby whose desire to interfere knows no bounds.” Yes, of course, that strange desire to restrict what companies that sell products that kill people are allowed to do. In the Notes to Editors on that website, it says that “The IEA is a registered educational charity and independent of all political parties.” Now I wonder whether the IEA is funded by the tobacco companies that have lobbied hard against plain packaging? That would be useful information, so why does the IEA not provide it, or even advertise it? Just how much should central bankers express views about fiscal policy? One reasonable response is not at all. Yet fiscal actions can have implications for monetary policy, so vows of silence are both difficult to sustain, and potentially withhold important information from the public. For example, I have recently suggested that it is almost undeniable that fiscal austerity when interest rates are at the Zero Lower Bound (ZLB) makes it more difficult for monetary policy to do its job. If I was a monetary policy maker, I would want to make that clear to the public, if only to avoid getting all the blame when things go wrong. I have praised Ben Bernanke’s recent comments to that effect, which he reaffirmed more recently. Of course, outside the Eurozone, it would be seen as wrong for central bankers to condemn these policies, but it must be right for them to point out that it causes them difficulties. So why does the ECB stand out here? One hypothesis that appears not to work is that the ECB has been dragged into commenting on fiscal issues by the Eurozone crisis. We could question, as Carl Whelan does (pdf), why the ECB is part of the Trioka? Was it dragged, or did it invite itself? However, as the ECB research cited above shows, the ECB’s unusual interest in making normative statements on fiscal policy predate this crisis period. One strong clue is the nature of these interventions. Bernanke warns that excessive fiscal tightness could slow down the US recovery, and because of the ZLB the Fed’s ability to counteract this is at least uncertain. The ECB always urges European governments to make fiscal policy more restrictive. That suggests that it either has a completely different view about the macroeconomic conjuncture in the Eurozone compared to the US (unlikely), or that it believes in expansionary austerity (see below), or that it is concerned about something else (much more likely). The something else which many economists would point to is fiscal dominance. The ECB and many other European policymakers seem obsessed by the fear that monetary policy will not be able to do its job because of excessive budget deficits in individual Euro member states. So how reasonable is this fear, and is the Eurozone special in this respect, so as to explain the ECB’s unusually vocal behaviour compared to other central banks? The answer is I believe quite clear - the ECB has less to fear from fiscal dominance than any other central bank! It was partly to show this that I wrote two recent posts on budget deficits and inflation. In the first, I made the widely accepted point that monetary policy can always neutralise the impact of higher debt on inflation by raising interest rates, if fiscal policy makers raise taxes or cut spending sufficiently to stabilise debt. Once you eliminate market panics through OMT, then it is absolutely clear that all Eurozone countries are doing that. 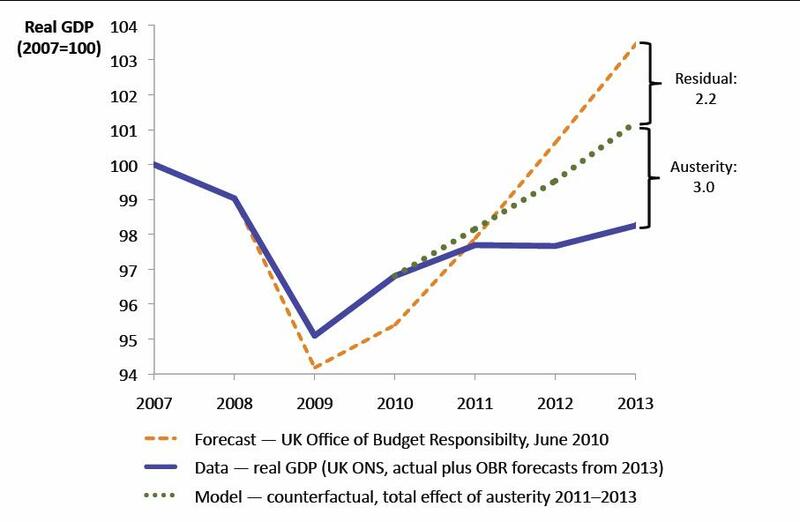 So there is no present threat of fiscal dominance. But imagine there was. In a second post I looked at the possibility that a fiscal policy maker might not even attempt to stabilise debt. In that case, a conflict between fiscal and monetary policy could emerge. Yet I argued that in any resulting game of chicken, if the central bank was able and prepared to allow governments to default and not monetise the deficit, it could retain control of inflation. Now in nearly all countries the government has ultimate power, so it could force the central bank’s hand (although at perhaps a very high political cost). However the one exception is the ECB. The ECB is in a better position to resist fiscal dominance than any other central bank. So we should see much less of a concern about budget deficits from the ECB than from other central banks, yet we actually see the opposite. I can think of only three explanations for this apparent contradiction. The first is that the ECB does not understand its own position. The second is that the ECB is really concerned about the distributional effects if countries pursue different fiscal paths. Yet if that was the case, they should be focusing on relative fiscal positions, rather than always suggesting lower deficits are good. The third possibility is that the ECB is using its position of authority to pursue other economic or political goals that have nothing to do with its mandate. The ECB is also fairly unique in its lack of accountability. Perhaps for that reason, it feels no inhibition in being free with its opinions on economic issues, even when they have no bearing on its ability to control inflation. This third explanation may also help explain the reluctance of the ECB to act as a sovereign lender of last resort. We had two years of an existential Euro crisis before OMT was introduced. The argument that is generally used to explain this reluctance is the ECB’s fear of fiscal dominance. However, as I have argued, the ECB has much less to fear on this account than others central banks, yet other banks were quick to undertake Quantitative Easing. As this piece reminds us, and as is noted by Peter Dorman here, pressure from the bond market can be very useful in helping achieve certain economic and political goals. So even though these goals have nothing to do with the ECB’s mandate, the ECB might be reluctant to see those pressures reduced by its own actions. I would like to be wrong about this. But if I am not, I think it is important to understand what it reveals. To quote Peter Dorman: “In their own minds they probably see neoliberal reforms as self-evidently beneficial to the point that there is no need to spell them out or argue for them: everyone they know understands that this has to be the solution.” They are just giving good economic advice, advice that is needed because politicians too often respond to vested interests rather than sound economic reasoning. If this reading is correct, then we have a serious problem. In this view about what is good economics, Keynes has completely disappeared. Not only the Keynes who showed why cutting government spending at the ZLB was a foolish thing to do, but also the Keynes who emphasised that prices in financial markets may not reflect fundamentals but instead just what market participants thought that other participants would do. This is the Keynes whose ideas (or interpretation of those ideas) feature heavily, and very positively, in every economics textbook, including those used by those teaching in Eurozone countries. So what remains a real mystery to me is how the elite who make policy in the Eurozone can feel it is legitimate to promote a view about what is good economics which contradicts what economists in the Eurozone teach. For central bankers to give advice on economic issues that are outside their remit but which pretty well every economist would sign up to is one thing. Of course central bankers will have their own private views on more controversial matters. However it seems to me that to give public advice on economic issues that are outside their remit which are also highly controversial (and contradict what is in the textbooks) seems to me to be crossing a line which it is very dangerous to cross. This is the insight behind the idea, emphasised by De Grauwe, that there may be a ‘bad equilibrium’ in the market for Eurozone government debt, which the ECB through OMT can help avoid. (For those unfamiliar with this idea, a good place to start is this piece by De Grauwe and Li.) It is interesting that the ECB, in justifying OMT, tends to favour the argument that the market has unjustified fears of Euro break up, rather than that the market is not looking at fundamentals. It is using an argument that remains consistent with Ordoliberal ideas. Central bankers, and even some of the best economists, sometimes talk about inflation expectations becoming ‘unhinged’. I do not like this term, and have been known to react quite badly to it. Some might say overreact. Let me say why. But before doing so, I want to make three things clear, lest I be misunderstood. First, I think inflation expectations are really important. Second, I largely believe the great moderation story. As a result of setting inflation targets (explicitly or implicitly), and acting to achieve them, central banks did succeed in stabilising inflation expectations at low levels, and this has made the job of stabilising the economy as a whole rather easier. I may be wrong about this, but that is what I currently think. (I chose this as an example of the achievements of the microfoundations revolution in macro in my mild disagreement with Paul Krugman on this issue.) Third, I think it is more than likely that if inflation stays above/below target for some time, inflation expectations will adjust. But I would not call this expectations becoming unhinged. It is all about language. I would have no problem if another term was used. I used the term ‘adjust’ above, but we could also say ‘increase’, or ‘become less predictable’, or even ‘shift’. In fact any of the other words we normally use for macroeconomic variables. When discussing consumption, we do not talk about expectations of future income becoming unhinged. When discussing exchange rates and UIP, we do not obsess about expectations of future rates being unhinged. Whether intentional or not, the use of the term unhinged is designed to create an impression. The impression is of disastrous uncontrollability. If we talked about a person become unhinged, we indicate madness. It is as if inflation expectations can be in one of two states: either low variance with mean reversion to the inflation target (or something close to it), or as highly volatile and could go anywhere. In this second imagined state, as expectations of inflation drive actual inflation, we could have ‘inflation bubbles’, which would become very costly for the central bank to prick. As we really do not want to go to that second state, we have to do everything we can to stay in the first state. It is this view of the world that I find very difficult to believe - in fact I find it absurd. Why would inflation expectations become so unanchored from a central bank’s inflation target? They would do so if people thought the central bank had no intention of trying to achieve that target. So the only circumstances in which inflation expectations might become unhinged are when the central bank itself became unhinged. That could happen if the central bank was ordered to permanently monetise growing budget deficits, but that is not the world we are currently in. When central bankers talk about unhinged expectations, they nearly always mention the 1970s and early 1980s. Do we really want to go through that again, they ask? Yet that was a period, in the US and UK, when it was very unclear what the central bank’s inflation target was, or indeed whether it had one. (This was not the case for Germany, as I note here.) So the lesson of that time is that inflation targets are important, but not that they should never be changed or missed. I would draw a very different lesson from that period. It is important not to have taboos in macro. If there was a taboo at that time, it was that rising unemployment would mean a return to the 1930s. This prevented many seeing variations in unemployment as a means of stabilising inflation. Could it be that we have a similar problem today, except roles have become reversed? With nominal rates at the zero lower bound, and doubts over unconventional monetary policy, we could use higher inflation (raised in a premeditated and controlled way) as a means of getting unemployment down. Of course that entails costs, and so we need to do the cost benefit analysis, and look at alternatives (like fiscal policy) that may be less costly. But if raising inflation is taboo we will not have that discussion. In this context, talk of expectations becoming unhinged reinforces that taboo. In memory of Mel, who showed even as a teenager an appreciation for the absurd by helping me found the LUWS. This post is about the impact of nominal and real wage flexibility on unemployment and the output gap. It starts in an academic, abstract sort of way, but the policy implications do follow. I try and make the analysis as accessible as I can to non-economists. In the Great Recession this mechanism did not work because nominal interest rates hit zero, and maybe also because monetary policy put a cap on inflation expectations. As a result, actual real interest rates are above the natural level. In addition, fiscal policy is in the hands of people who know nothing about macroeconomics, so there is no help from there. However monetary policymakers still think they could do something ‘unconventional’, so they want to know what to aim for. The answer is that, as long as what they do does not seriously distort the economy, they should try to get to the natural level of output, because that produces an efficient economy. The difference between the actual level of output and the hypothetical natural level is called the output gap. The traditional way of defining the output gap was the difference between actual output and ‘productive potential’, which was the amount that could be produced if all factors of production were fully utilised. That is still how the gap is often measured in practice, although the measurement problems can still be huge, as Paul Krugman notes here. The problem at a conceptual level is that this approach downplays considerations of optimality, so nowadays theoretical macroeconomics uses the natural level of output to define the output gap. This has the advantage that we know what policy should be aiming to do: achieving the natural level of output. Now imagine three almost identical economies where an output gap exists because nominal interest rates have hit zero. The level of real interest rates that would eliminate the output gap is the same in all three economies (i.e. they have the same natural levels of output). In the first economy, workers resist nominal wage cuts, so this puts a floor on how much unemployment reduces real wages. (Equally firms may be reluctant to impose wage cuts, as this research suggests - HT Kevin O’Rourke.) If nominal wages stop falling, at some point firms will stop cutting prices to protect their profits. We settle down to a new lower level of demand deficient output, high unemployment, but stable wages and prices. There is plenty for unconventional monetary policy to do, even though inflation is not falling. In the two other economies nominal wages carry on falling. In the second economy prices get cut pari passu, so real wages remain unchanged, while in the third they do not, so real wages fall. So in the second economy inflation is lower than in the first, but real wages are the same. Does this lower rate of inflation increase or decrease the output gap? That depends only on whether actual output falls or increases because of lower inflation: the natural level of output involves a hypothetical economy which is unaffected by whether nominal wages fall or not in the actual economy . Actual output may fall if negative inflation makes debtors spend a lot less but creditors not much more - this and other mechanisms are discussed in Mark Thoma’s post here. However, if monetary policymakers have been inhibited from doing much because inflation was not falling (which would be one interpretation of UK policy, for example), then as David Beckworth says, lower inflation may raise actual output by encouraging expansionary unconventional monetary policy. How about the third economy, where real wages have fallen? Suppose firms respond to lower real wages by substituting labour for capital, and this process continues until all those who want to work can find a job. So in the third economy involuntary unemployment goes away. But is the output gap any lower? Once again, the natural level of output has not changed. (It was set in our hypothetical economy where real interest rates fell to their natural level.) So the key question becomes whether lower real wages and lower unemployment reduces or increases aggregate demand, and therefore actual output. It could go either way. So it is perfectly possible that both actual output and therefore the output gap is exactly the same in all three economies, even though unemployment has returned to its natural rate in one, and the other two have very different inflation rates. This comparison suggests that those who say unemployment in the first two economies is caused by wage inflexibility kind of miss the point. The basic problem is lack of aggregate demand. You could argue (I would) that the third economy is better off than the other two, because the pain of deficient demand is evenly spread (everyone has lower real wages), rather than being concentrated among the unemployed. But the first best solution is to raise aggregate demand, because that gets rid of the pain. I started writing this post because of a recent study by Pessoa and van Reenan, who argue that the mysterious decline in UK labour productivity that I have talked about before can in large part be explained by unusually slow growth in UK real wages. The mechanism they have in mind is entirely traditional: if real wages are low firms substitute labour for capital. This in turn may explain (see Neil Irwin here for example) why UK unemployment originally rose by less than in the US (see first chart), even though the UK’s output performance was worse. On this issue looking at consumer price based measures of real wages will be misleading, so below is a very simple measure of real product wage growth in the two countries: compensation per employee less the GDP deflator. Real wage growth in the UK has noticeably fallen since the recession, whereas the fall has at least been less abrupt in the US (2013 is a forecast). In terms of just the UK economy, whether Pessoa and van Reenan are right is debatable. When I discussed this in an earlier post I referenced a Bank of England paper by MPC member Ben Broadbent, which argued that for the factor substitution story to explain most of what we have seen in the UK, investment should have completely collapsed, which it has not. This difference in view reflects a number of nitty gritty issues, like how you measure the capital stock, and whether the substitution elasticity is one (as implied by the Cobb Douglas production function), or nearer one half. However most seem to agree that some of this factor substitution is going on in the UK. So my hypothetical discussion above suggests that, by spreading the pain of deficient aggregate demand further, this ‘real wage flexibility’ in the UK has been a good thing, but it does not mean the aggregate demand problem has decreased. 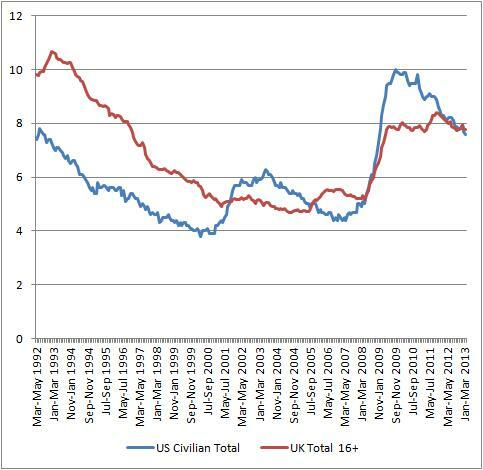 If anything, it suggests that looking at unemployment underestimates the size of the output gap. Monetary policy makers please note. New Keynesian economists sometimes call the natural economy the outcome when all prices are completely flexible. That is OK, as long as we note that flexible prices here has to include the possibility that nominal interest rate can go negative, which in the real world it cannot. Opinions may differ on whether the crisis itself is a necessary correction for past errors, or whether it is itself a distortion. For example, was risk undervalued before the crisis, or is it overvalued now. In other words, was the pre-crisis economy efficient, or would there be a distortion in the post-crisis economy even without an aggregate demand problem? These are important complications compared to the story I tell here, but they will have to wait for another post. The idea is that the economies are identical except for the extent of nominal inertia in goods and labour markets. In economy 1 wages are sticky, in economy 3 prices are sticky but wages are flexible, and in economy 2 the degree of wage and price stickiness is such that real wages do not change. It really was predictable. Take away the ability to control national interest rates, and you create a potential for patterns of demand to diverge, leading to movements in competitiveness that would have to be painfully unwound later on. The good news was that you could use countercyclical fiscal policy to moderate these movements - an entirely conventional macroeconomic idea. But it was not what the architects of the Euro wanted to hear. This is how my paper just published in Global Policy starts. So instead of countercyclical fiscal policy, we got an obsession with budget deficits and the possibility of fiscally profligate governments. Even with this obsession the Eurozone failed to spot its one member that was behaving in this way until it was too late. But in looking in the wrong direction, the Eurozone allowed just the kind of competitiveness imbalances to take place that fiscal policy might have been able to do something about. This is not wisdom from hindsight. Before the Euro was established, I was among a large group of economists suggesting that fiscal policy should be used countercyclically by Eurozone members. That work continued after the Euro was established: here and here are just two examples. It had no impact on policy. There was a lot we did not foresee. It is particularly ironic that the first major asymmetric shock to hit the Euro area, that would cause these large competitiveness imbalances, was arguably a consequence of the creation of the Euro itself. But the point remains that a method of handling these things, which was entirely conventional in macroeconomic terms, existed and was ignored. Now in saying this I find myself in the rather unusual position of disagreeing with Martin Wolf. He has argued (here for example) that a country like Spain could not have done more in terms of fiscal policy to counteract its housing boom. I have heard many others make the same point - you think Spain should have been running even larger surpluses? they ask incredulously. The answer is simply yes: by looking at fiscal surpluses you are looking at the wrong indicator. Here is what happened to consumer price inflation from 2000 to 2007. Inflation was significantly above the Euro area average year after year. If the average inflation rate had been 10%, or even 5%, this might not have been a big deal, but when the inflation target was 2% or less, that makes reversing these trends very painful. Looking at budget surpluses during a property led domestic boom can be very misleading, as Karl Whelan argues in the case of Ireland. There may be many reasons why the Eurozone ignored this advice. One was probably a belief among some that countercyclical fiscal policy was either ineffective or dangerous. (The ordoliberal logic on this has never really been spelt out, and it seems more like an article of faith.) Another was an almost mystical belief that the creation of the Euro would diminish the importance of asymmetric shocks or the extent of asymmetric structures. Yet another was a view that the far greater danger lay in the reduced fiscal discipline that being part of the Euro would bring, and any countercyclical role would only encourage this ill discipline. Yet we now know (and I do not think anyone really foresaw this) that this last argument is completely wrong. Not having your own central bank means that market discipline on Euro members’ fiscal policy will be much greater, once it is understood that national default can occur. I do not think this point has sunk in yet among many macroeconomists. The standard line, backed by academic papers, was that joining a common currency would reduce market discipline on fiscal policy. Yet that analysis ignored default, and the possibility of a bad equilibria generating a self-fulfilling crisis. Countries will not forget the events of 2010-12 in a hurry, so the danger now is that we have too much, not too little, market discipline influencing fiscal policy. Ironically, the architecture of the Stability and Growth Pact sent all the wrong signals. By stressing the dangers that individual countries might free ride on the Eurozone, it suggested that such actions might be in the national interest for any country that could get away with it. That is why attempts to control national budgets at the Eurozone level can be counterproductive as well as unnecessary. It is far better to build national institutions that can make sure countries develop appropriate fiscal policy which is in their national interest. In an ideal world the Commission might play a coordinating role, but given its current mindset it would be best if it just stayed out of the picture. This makes me both optimistic and pessimistic about macroeconomics as a discipline. Optimistic because the subject has so much potential to do good: basic ideas, long understood, yet clearly not obvious to some, can help prevent disaster. (Those who claim that macroeconomics is the weak point of the economics family should take note.) Pessimistic because even when those disasters occur, the macroeconomic wisdom continues to be ignored. If anything, formation of a currency union should allows greater national specialisation, which of course has the opposite effect. Tony Yates thinks there should be no more [sic] fiscal stimulus in the UK, because inflation is above target. As inflation is above target, there is no need to stimulate demand. Tony accepts that in principle at the ZLB fiscal stimulus can be a useful expansionary instrument, but in the UK at the moment it is not required. So here is a table of CPI inflation in a few countries. The inflation target in the UK is 2%. So not only is there no case for any stimulus going forward, it also looks like the UK managed to completely avoid any recession in 2008/9! The US also had a small boom in 2011, and who knows why people in the Eurozone feel so depressed? OK, this is a cheap point, but a valid one nevertheless: CPI inflation is a pretty hopeless indicator of the output gap when inflation is low. 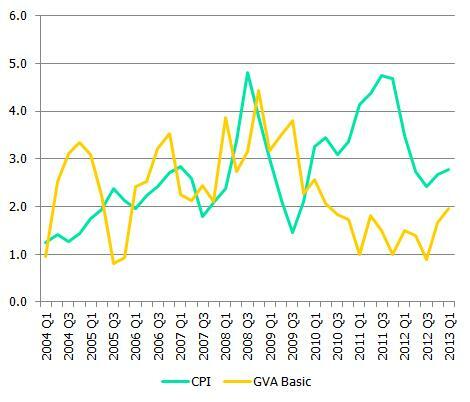 Other inflation measures do a bit better: here is the GDP deflator at basic prices. Some of the low growth in the GDP deflator is because of low inflation in the government consumption deflator, and we know this is difficult to measure. However I’m not trying to argue that one index is better than another. Instead I just want to make the point that at low levels of inflation, inflation itself becomes a very unreliable measure of the output gap. This is true not just in the UK, as the IMF recently pointed out. 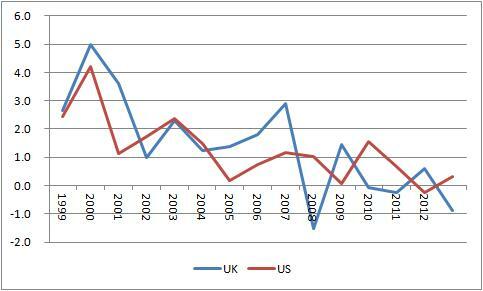 One reason why UK inflation has not fallen further is UK labour productivity, which I have discussed before. Now if the decline in UK productivity growth was an irreversible supply side phenomenon then you could indeed argue that the current UK output gap was small (but not zero - see below), but is this remotely plausible? 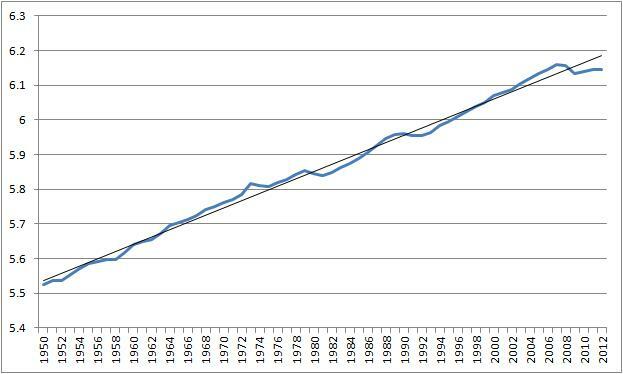 Here is a chart of (logged) UK GDP since 1950. I’ve added a trend line not because I believe productivity growth is always constant, but just so the following point becomes clearer. GDP growth does sometimes fall sharply: in 1980, and in 1990. But both these occasions were demand induced recessions. To argue that 2008/9 is different means that something quite extraordinary and unprecedented has happened. Now maybe that is possible, but given the costs of being wrong about this, we have to be pretty certain of your story to base policy on it. So let us look at something we can measure with reasonable accuracy: unemployment. So it seems to me that we are sitting in a freezing house, but because the thermostat says it is still warm, its occupants are trying to convince themselves that they are not really feeling cold, and the last thing they want to do is turn up the heat. (I admit not the best of analogies for the UK right now.) Just because we build models in which inflation always responds in a predictable and linear way to the output gap, does not mean that the real world behaves in the same way. I’ve spliced the recent ONS data revision from 1998 on to a time series from Lawrence H. Officer and Samuel H. Williamson, 'What Was the U.K. GDP Then?' MeasuringWorth, 2012. In an earlier post I went through the logic of why we do not think higher government debt necessarily causes inflation, even if that debt is denominated in nominal terms, as long as the central bank does not monetise that debt. As I argued there, talk of monetisation is largely unnecessary: we just need to say that the central bank uses interest rates to control inflation, and can therefore offset the impact of any increase in government debt. However, as Mervyn King said, central banks are obsessed with budget deficits. This seems to contradict the previous paragraph. Are there some ways in which central banks would either lose the power to control interest rates, or be forced to abandon any inflation targets, as a result of fiscal policy? In the previous post the thought experiment I considered was a sustainable increase in the level of government debt. By sustainable I mean that the fiscal authorities raise taxes (or cut spending) to service this higher level of debt. But suppose they do not: suppose the budget deficit increases because spending is higher, but there is no sign that the government is prepared either to cut future spending or raise taxes to a sustainable level. In 1981 Sargent and Wallace published a well known paper which said that, in this situation, the central bank could in the short term control inflation, but in the longer term inflation would have to rise to create the seignorage to make the government budget constraint balance. In other words, to keep the economy stable the central bank would eventually be forced to monetise. This was later generalised by the Fiscal Theory of the Price Level (FTPL). 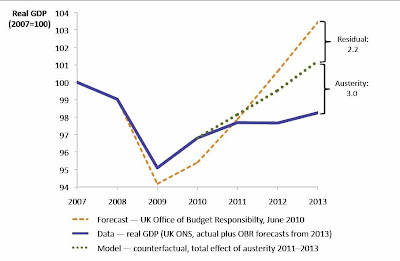 If the government did not act to stabilise debt itself (which Eric Leeper called – a little oddly - an active fiscal policy, and which others - including Woodford, Cochrane and Sims - have called even more confusingly a non-Ricardian policy ), then the price level would adjust to reduce the real value of government debt. Fiscal policy determines inflation. One of the critiques of this theory is that the government budget constraint appears not to hold at disequilibrium prices. See, for example, Buiter here, and a response from Cochrane. I do not want to go into that now. Let’s also concede that if the monetary authority does either follow a rule that allows the price level to rise (by fixing the nominal interest rate for example), or tries to move interest rates to both stabilise debt and inflation (as in my recent paper with Tatiana Kirsanova), then the FTPL is correct. The case I want to focus on here is where the central bank refuses to do either of those things, but carries on controlling inflation and ignoring debt. Suppose the government is running a deficit which is only sustainable if we have a burst of inflation which devalues the existing stock of government debt, but the central bank refuses to allow inflation to rise. You can say it does this by fixing the stock of money, or by raising the rate of interest - I do not think it matters which. This is an unstable situation: interest payments on the stock of debt at the low price level can only be paid for by issuing more debt, so debt explodes. In this situation, we have a game of chicken between the government and central bank. Now the game of chicken would probably end when the markets refused to buy the government’s debt. That would be the crunch moment: either the central bank would bail the government out by printing money, or the government would default, which forces it to change fiscal policy. But in Buiter there is an elegant equilibrium outcome: the market just discounts the value of debt by an amount that allows the central bank to set the price level, but for the government’s budget constraint to hold at that price level. We get partial default. This discount factor becomes the extra variable that solves for the tension that both fiscal and monetary policy are trying to determine the price level. Has any of this any relevance to today’s advanced economies? It seems to me pretty clear that these governments are not playing any game of chicken. Quite the opposite in fact: they are being far too enthusiastic in doing what they can to stabilise debt, despite there being a recession. So we certainly do not seem to be in a FTPL type world. Instead monetary policy right now retains fiscal backing. Yet in a way we are having the wrong conversation here. Rather than trying to convince central banks that their fears are groundless, we should be asking whether monetary policy should – of its own free will – raise inflation to help reduce high levels of debt. I agree with Ken Rogoff that it should, and have argued the case here. Yet however optimal such a policy might be, the chances of it happening in today’s environment are nil. It looks like we may have to go through a lost decade before we are allowed to contemplate such things. I guess a rationale for calling this fiscal policy ‘active’ is that stable regimes in Leeper require one partner to be active and the other passive. So in the normal regime monetary policy is active and fiscal passive, and this flips in a FTPL regime. In a FTPL regime, Ricardian Equivalence no longer holds (because taxes are not raised following a tax cut) – hence the label non-Ricardian. In this situation, would buying that government’s debt ‘show weakness’ in the game? If we follow Corsetti and Dedola and treat reserves as default free debt issued by the central bank rather than money, then not at all. Instead the central bank is giving the fiscal authority the best chance it can to put its house in order, by removing any bad equilibrium, but it retains the power to force default at any point. We no longer have Buiter’s method of resolving that game, but only because the central bank has the means which could force a win. As long as the government believes that the central bank would prefer the government to default rather than see inflation rise, the government should back down.